H/T goes to Chuck B.
I have been giving thought to religious tests. The United States Constitution forbids the use of religious tests to be an elected official for federal office. Sadly though, we may not allow them de jure, I have sensed that the public demands a de facto religious test, at least for the office of president but I digress. I – Of GOD and RELIGION. A Mason is obliged by his Tenure, to obey the moral law; and if he rightly understands the Art, he will never be a stupid Atheist nor an irreligious Libertine. But though in ancient times Masons were charged in every country to be of the religion of that country or nation, whatever it was, yet it is now thought more expedient only to oblige them to that religion in which all men agree, leaving their particular Opinions to themselves: that is, to be Good men and True, or Men of Honour and Honesty, by whatever Denomination or Persuasion they may be distinguished; whereby Masonry becomes the Centre of Union and the Means of conciliating true Friendship among persons that must have remained at a perpetual distance. This was a fascinating addition to Masonry. It also began a strongly heated battle for supremacy in English Masonry. The Antients took great offense over the removal of Christian symbols in favor of a religion in which all men agree. In fact, the Antients were appalled that the Moderns allowed non-Christians to become Masons at all. The religious nature of Freemasonry was a major bone of contention which led to the disagreement. I have wondered if we, even now, carry on this strange Antient versus Moderns fight, of where religion may exist, of whom may or may not be a brother. I think it is safe to assume, particularly after reading a few letters to the editor in the KT Magazine, that some brothers would rather see Masonry be a single, homogeneous group, dedicated to the worship of Christ alone and not to that religion that all men agree. Is there a solution? I was noodling this idea. In using a VSL for our brothers to swear an oath on, we allow whatever holy book would bind him to his oath. Instead of focusing on the exact nature of what he is swearing on, what if we standardized one book to be used in all obligations? All lodges would be required to swear candidates only on the King James Version of the Bible. Whoa?! Didn't he just say that we shouldn't Christianize the Craft? Now stick with me. The thing is that when we ask a candidate what book he would like to be sworn on, it immediately calls the question of what religion he is. The Volume of Sacred Law is a symbol just like everything else. By viewing the KJV Bible as just a symbol in the Work, we remove the religious distinction from the candidate. Furthermore, those candidates that profess a belief in God but remain unaffiliated to any particular religion will not be required to then declare one. It also increases the anonymity of faith, allowing all brothers to meet on the level, without distinction as to politics and religion. On the other hand, by restricting candidates to one VSL, he may feel that his oath is not legitimate because he is not swearing on the book he holds dear. It also may lead to the same belief that I see in the Knight Templar magazine, that Masonry is a Christian organization that was kind enough to allow other men. Personally, I prefer the idea of the cultural mosaic over the melting pot. When we place different VSLs on the altar, we are making a quilt of connection, sewn together as much by our differences as our similarities. It's difficult to weigh both the desire for inclusiveness without distinction. I'm not sure what the answer is but I fear the Antients and the Moderns are still fighting to this day. Perhaps the future will be different. What do you think? Should we use only one VSL or should each candidate be allowed to choose based on his religious belief? 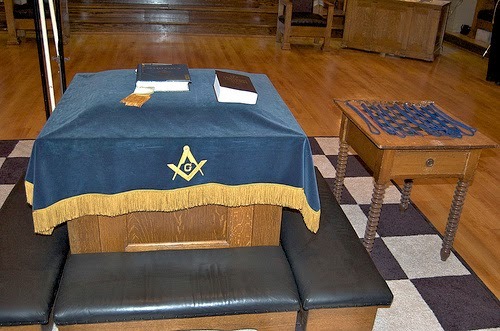 Last night's Roundtable I had to miss because of my lodge's third degree (which was spectacular, BTW). Thankfully, we had a proper host show up, Tom Accuosti from the Tao of Masonry. Tom and I go way back. Last night's episode was on fundraising. It's an interesting discussion. Personally, I feel that lodges should only fundraise for external causes. Fundraising and dues as an interlocking discussion. Obviously, we must cover shortcomings in our budgets but frankly, those shortcomings should come from dues and banked money from dues over the years. My usual statement is that the public should not be paying for Masonry. Masonry isn't public. Most of our activities are for the individual brothers. By having the public pay for us, we admit that 1) we don't value the Fraternity enough to cover our own expenses and 2) we expect others to pay for it. This doesn't mean that we can't fundraise. My own lodge hosts a yearly waffle breakfast where all the proceeds go to high school scholarships. I think this is good and it also gets the public in to support their local students. It's a great feeling knowing that the community is coming together to help out our students. But, again, this is for an external cause, not keeping the water bill paid and lights on. Great show, guys! I really enjoyed it. I'll see you next week. And Jason, glad to see you have a blog going. Visit the 2 Foot Ruler blog here.